Hip hop culture, established by the dispersed, yet energetic youth of the 80's and the 90's, has reached the crux in its design in the 2000's. Currently, it is not only appreciated by a diverse population of people across the globe, but it also provides the foundation for their life experiences and even world view. Hip Hop is undoubtedly one of the most relevant cultural experiments to have occurred in the last century. 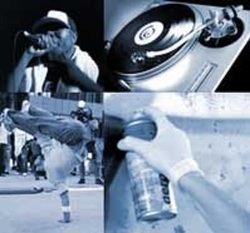 It is commonly classified into 4 elements: MC'ing, DJ'ing, graffiti, and B-Boying (clockwise in the picture). Each of these elements has had an influential impact on the global hip hop audience.